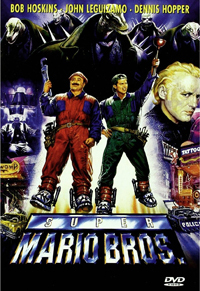 This ongoing section aims to uncover any and all deleted, extended, or alternate scenes from the film. Some are just pure speculation, while others have a basis in drafts of the script (or other sources). And, for some of these scenes, we've been lucky enough to obtain video footage or screenshots. 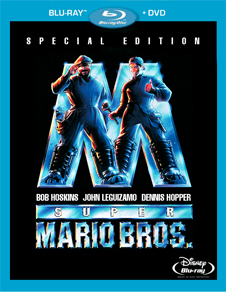 This is a mock-up artwork for a Special Edition Blu-Ray release. 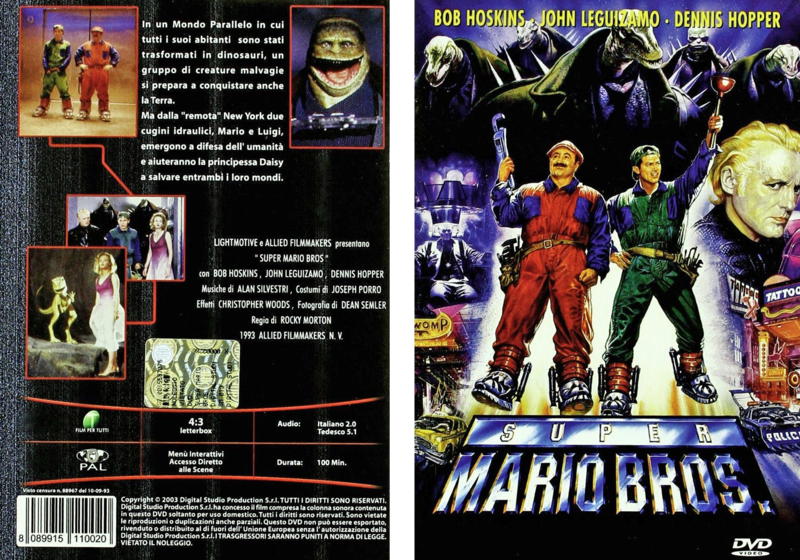 Apart from the 2010 Njutafilms Swedish release, all copies of the Super Mario Bros. movie have been based on the digital print used for the 1993 LaserDisc release. Because of this, the print is non-anamorphic and lacking in image quality - with fans missing image detail and sound quality as a result. 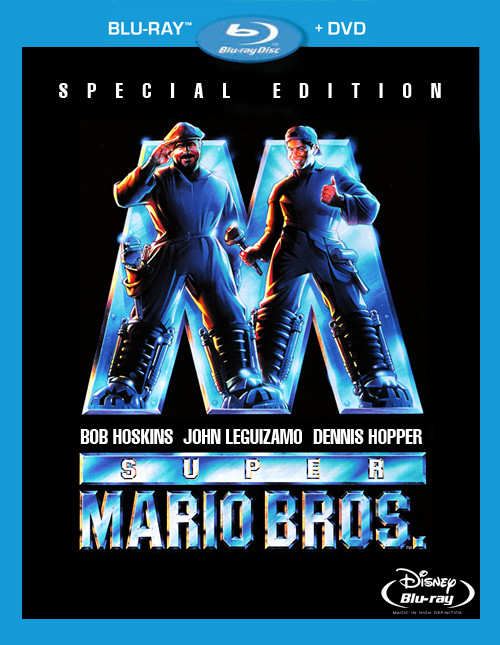 We would hope for a new remastered print for the Blu-Ray, as well as being given extras that are already available in releases across other countries and on TV. 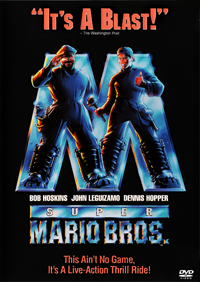 This would be the most important update to the release list since the original DVD launch, and would bring the quality of the sets and homages forward to a whole new audience. 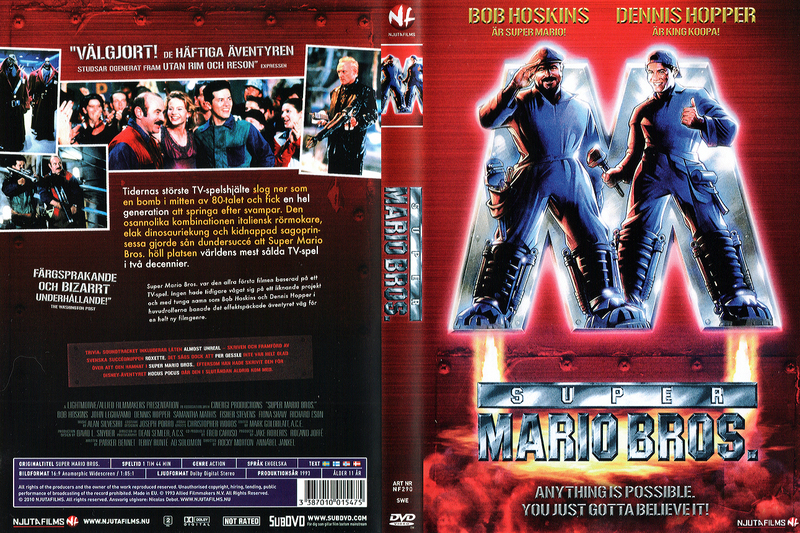 This Sweden-only release has some vast improvements over the other DVD releases of the film. Firstly it is Anamorphic, meaning you get more image detail as the picture is physically bigger (1024x576 instead of 720x384) as well as better colouration. 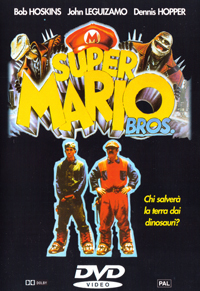 The image appears to be from a different film source to the US/UK/Italian releases, which feature stronger colours but more dirt on the negative. There is also a section at the end which suffers from interlacing issues (Movement bleeding horizontally) but corrects itself eventually. Mostly a better print, it does only have Stereo sound (To match the other European copies), making the US release the only surround sound release available. 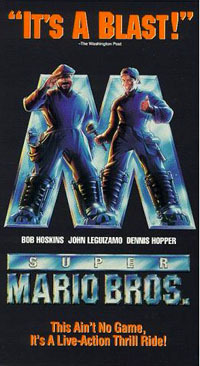 The most recent US release of the film. 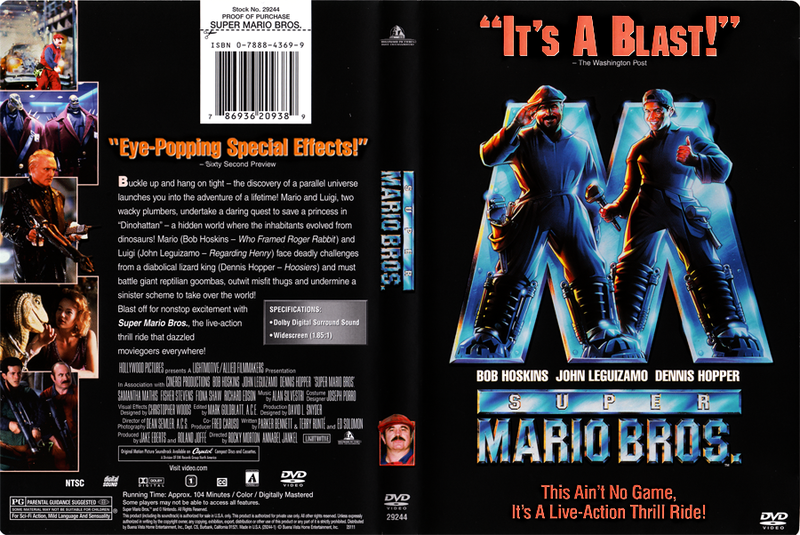 Compared to the original 2003 DVD release, the tagline and quote has been moved to the bottom of the cover in order to feature the film's logo at the top. 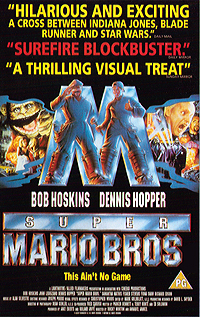 Notice the printing error on Dennis Hopper's Koopa on the back cover--this seems to be present in all copies of this version. It is also worth noting that this release does away with the matte/gloss scheme present in all USA releases of the film since 1993. And again, there are no special features to speak of, the disc itself is unchanged from the 2003 release. The original UK DVD release from Pathe! under their In2Film brand. The cover is completely matte finished, with a more colourful cover art than the US releases. 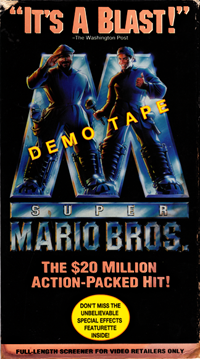 Comes with a 30 second rendition of the original Super Mario theme from the games in the main menu. Other than this, it appears to be identical to the US releases, down to the non-anamorphic format. 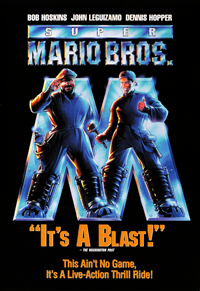 A slightly different cut of the film than the usual releases (The ending has been cut so Mario and Luigi never go back to Brooklyn), there is also a brand new artwork of Mario's trademark hat as a logo for the movie as seen on the boxart. 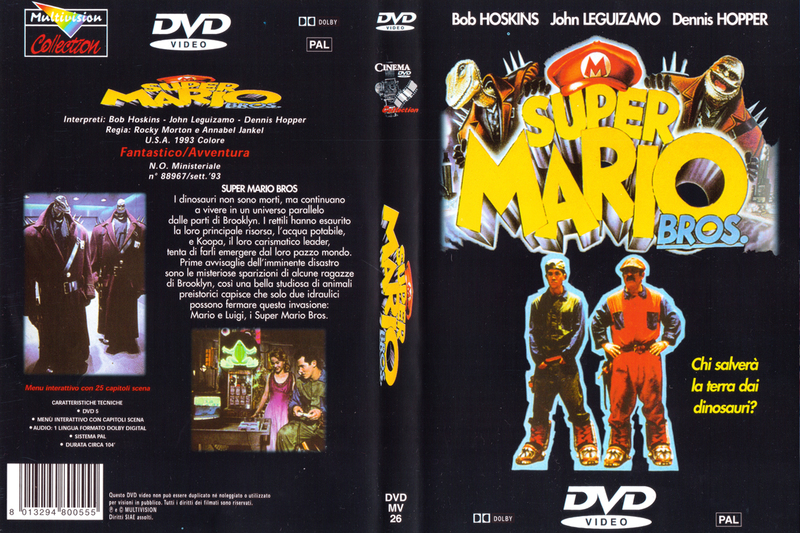 The language has been changed to a Stereo mix of Italian dubbing and the video seems to be the same print as the US Disney release but with horrendous interlacing issues with the picture bleeding horizontally. 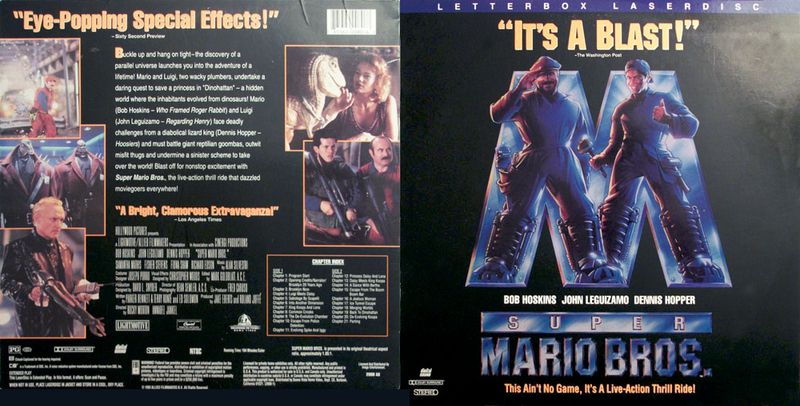 The boxart also includes a Goomba wih Yoshi's head and a Behind The Scenes photo of Luigi playing a SNES. 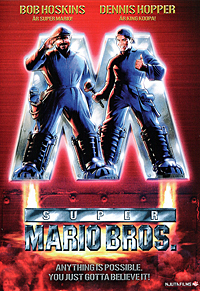 The scan of the boxart seen here is accurate, the boxart really is that badly put together. Appears to be a Venecian release, which is why the German language is "Tedesco" - a German-centric area of Venice. 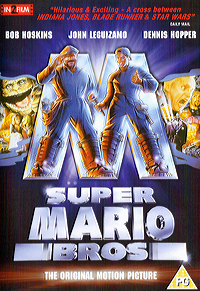 The original DVD release from Walt Disney Video. 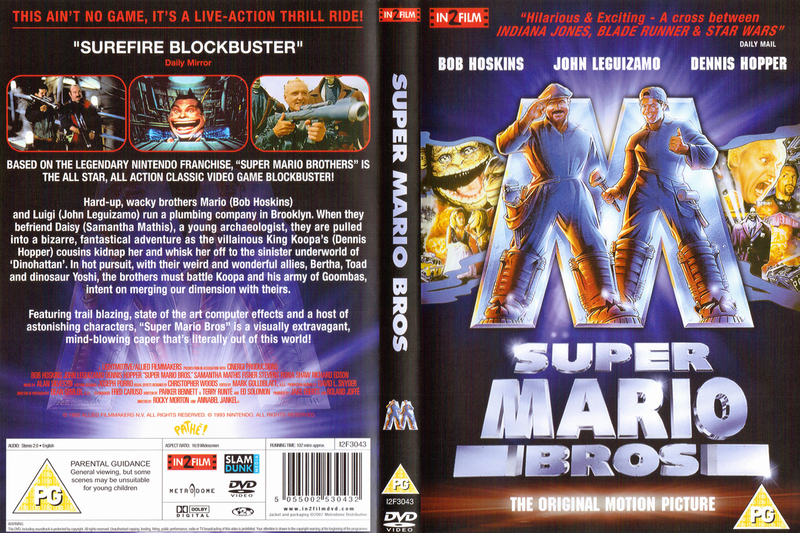 The "matte/gloss" scheme between the background and graphical elements remains the same as with the VHS and LD releases. This is an upgrade from the previous releases despite being non-anamorphic and including no special features. 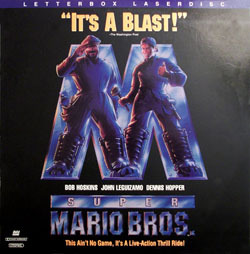 The original LaserDisc release of the film. The quality is decent, just a tad below the DVD in my book. 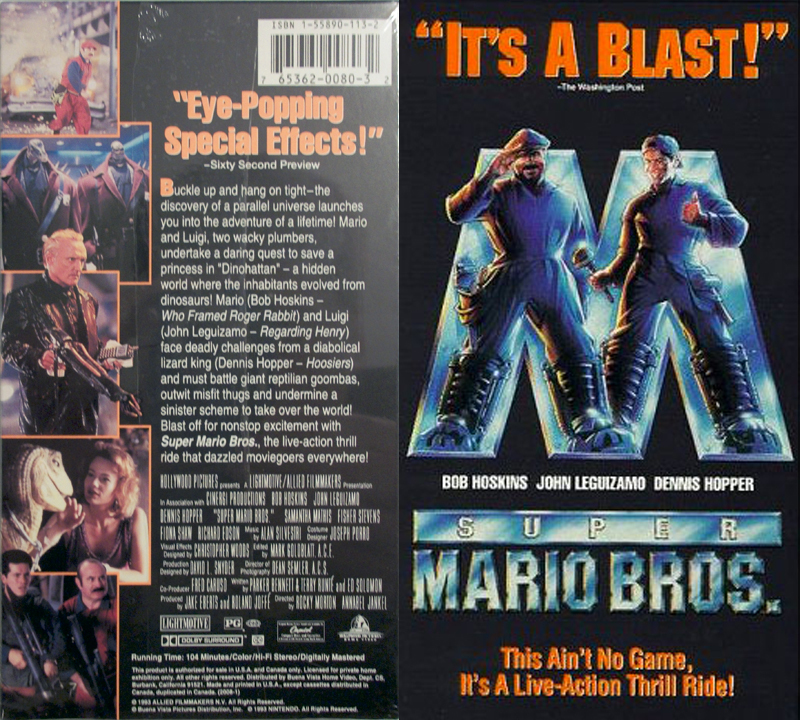 One interesting thing to watch out for on the back cover--the selection of a third quote unseen on the VHS or DVD versions: "A Bright, Clamorous Extravaganza!" The original VHS release than many a Mario fan grew up with. 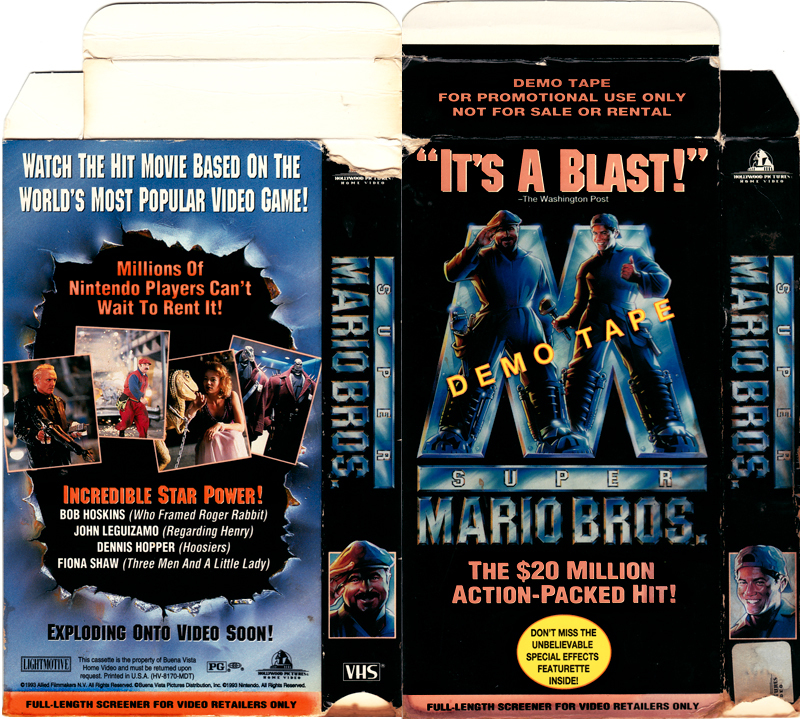 This demo screener VHS was sent to video stores prior to the release of the film on home video. 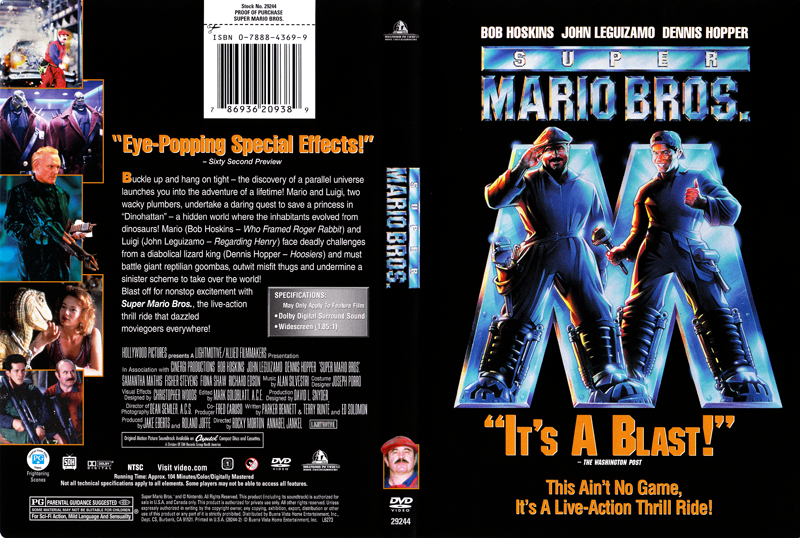 The interesting thing here is that this screener has a short special effects featurette (composed of clips from the longer "Making of Super Mario Bros.") that has not been included in any other video release to this day.